Platform: 1”. I do to note and/or photograph any flaws, stains, tears, and overall wear. In very good pre-owned condition. Very minimal wear. There is a scuff mark on the toe of the left shoe. Michael Kors Jill Leather Wedge Black Women's sizes 5-11/NEW!!! HEEL WEDGE SANDAL HEEL~10M. GENTLY USED AND MINIMAL SIGNS OF USE. SUPER CUTE SHOES! THE SHOES HAVE BEEN CLEANED AND SANITIZED AND IS READY FOR USE. Black wedge heel. Black suede upper. Heel height - 3 1/2". Made in Brazil. Preowned with normal signs of use. No noticeable wear, rip or tear. Very good preowned condition. Michael Kors 7M Purple Patent Leather Wedge Heels Slingback Platform Peep Toe. Normal wear and faded please judge pictures above. In excellent condition Condition is Pre-owned. Shipped with USPS Priority Mail. Approx 4 3/4 heel height. these have been worn and show light wear. very small that I haven't noticed or wouldn't think twice about. Not responsible for fit. Espadrille wedge heel. Heel height - 3 1/2". Blue fabric upper. Very good condition - bit of creasing, couple scratches & scuffs. Peep Toe Suede Wedges. Material: suede, sole: rubber. Heel height: 4" (10.2cm). Insole length: 9 1/4" (23.5cm). Insole width: 3" (7.6cm). Color: dark brown. Pristine condition, worn once, only barely noticeable discoloration on lining (toes area). Shoes are marked size 9 1/2 but I think it will fit 9 also. New, no box. The wedge is not cork. KORS Michael Kors Womens Red Peep Toe Wedge Heel Size 6. Some minor scuffs and scratches (refer to pictures) but still in very good condition. Any questions feel free to message me! 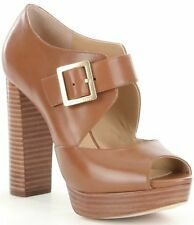 Platform wedge heel. Black suede leather upper. Heel height - 3". Color: Bisque Toe shape: Peep-toe. Size: 5.5 (US) or 35.5 (EU). Heel height - 3 1/2". Very good condition - minimal creasing, few scratches & scuffs, scuffed sole bottoms. Black patent leather. Michael Kors Damita Sandal Leather Black Women's sizes 6-11/NEW!!! Beautiful Strappy Detail. Style & Details:Stylish, High Heel, Pump. Condition:Very good used condition! Most of the signs of wear are at the bottom of the shoes, where you walk on them. Very light signs of wear on the upper and outer soles. Cross peep toe. Cutout wedge heel. Black patent leather. Heel height - 4". Made in Brazil. 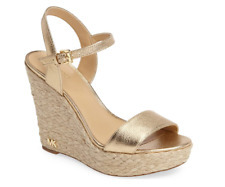 Gold tone wedge. Patent leather. Slip-on style. Size 6 (B,M) solid black suede with the wedge of a rubber textured material. The soles and heels are leather, these heels are suitable for a dress occasion. Other than the one flaw, these heels have been very gently cared for and are in excellent condition. 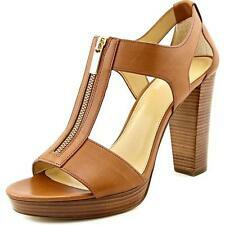 Platform wedge heel. Beige suede upper. Heel height - 3 3/4". Very good condition - bit of creasing, couple scratches & scuffs. These heels are gold featuring a wooden Stiletto heel. These heels would look amazing on a size 7. These heels have beautiful wine colored suede with soft leather lining. They have silver zip backs with the MK logo on the zipper.